This is the largest of three canvases Matthew Moss carried out in the tropical rainforests of northeastern Australia. The other two canvases depicting an area of mangrove swamp, were brought to a lesser state of completion because of the physical conditions involved in working out of doors in a jungle area. The latter two were finished in the studio, using gouache and pencil drawings done on the site.This canvas was painted close to the mangrove swamps, in the lush tropical gardens of a house built on stilts and constucted of corrugated iron, belonging to a prawn fisherman. Apart from modifications to the design of the roof and the water tank beneath, the work remains essentially the same as worked on in-situ. What principally attracted the artist was this magic area's abundance and variety of trees that range from the dying palm on the left to the banana plants on the right. They sail into the air and form a baroque frame to the sky, with the dark shadows of the jungle reaching down to the rear of the house and forming a backdrop.The central feature of the painting is the group of three papaya or papaw trees set to the left of centre canvas, which sweep to the top of the roof and reveal a fourth beyond. At the base of the trees are scattered fallen ripened orange coloured fruit which lead right of centre to the dying foliage of the lower parts of the fruit laden banana tree. The theme of the papaw trees is repeated in the dark background sketchily indicated in dark green. 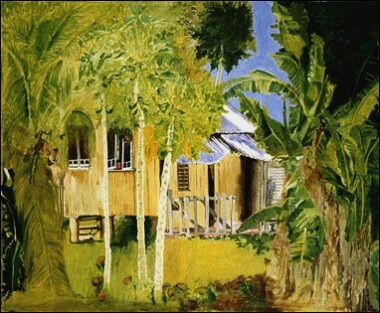 The leaves of the palm trees to the left are suggested by feathery brush strokes and continued by the foliage of the papaw trees to complete the circle enclosing the fisherman's house. This painting by Matthew Moss, in oil on white primed canvas, is fairly representational of his Australian tropical rainforests period. The multiplicity of forms represented by the different trees permitted the artist to create a pattern of shapes and lines giving a sense of movement that put into contrast and frame the form of the tin-built hut.